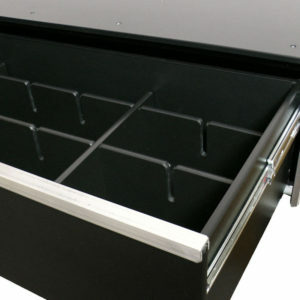 Store and organize your valuables with our Drawer Divider Kits. Available in kits or packs, dividers are both interlocking and interchangeable with each other. Dividers come in two sizes: 54 ½”W x 5”D and 20 ¼”W x 5”D. They are made from the same ¼” composite material (black) found on the Truck Storage Drawer Models. Divider Kits are removable and re-positionable at any time.